When I walked by a place called Cafe Beignet on Royal Street in the French Quarter in New Orleans, I decided to stop in. I had sampled beignets from Cafe Du Monde a couple of days earlier and wanted to get beignets somewhere else in New Orleans to compare. Cafe Beignet was in a cool little brick building. It was long and narrow with low, arched ceilings. Cafe Beignet had signs hanging on the wall proudly announcing that they were featured on Food Network's Best Thing I Ever Ate with Alton Brown. I did a little Youtube searching and found the segment from the show that featured Cafe Beignet. Alton Brown endorsed beignets are probably good beignets, right? I didn't get the proper beignet accompaniment and get chicory coffee. I instead ordered a chai latte to drink. It was pretty standard. Then it was time to try the beignets! I'm sorry to disagree with Alton Brown, but I preferred the beignets from Cafe Du Monde. The beignets here were much denser than the fluffy beignets that Cafe Du Monde served. Not to say that these weren't good. I think it would be hard to mess up a beignet too badly, but if I had to choose, fluffy beignets would beat dense beignets. I was trying to decide where to eat dinner while walking around the French Quarter in New Orleans when my nose made the decision for me. The French Market Bar and Restaurant had a porch where they were cooking crawfish. The smell wafting out of the boiling pot was so tempting that I went in to have some crawfish. I ordered 1 pound of crawfish along with a side of corn, potatoes, and sausage. This steamy boat-shaped bowl of bottom feeders was a huge amount of food. According to my server, most people order at least two pounds, but one was plenty for me. They had a nice garlic flavor that wasn't too overpowering. After a day of wandering and riding streetcars around New Orleans with no real destination in mind, it was decided it was dinner time. A random streetcar stop was chosen which appeared to have some nearby restaurants, and we started exploring. A Lebanese or sushi restaurant were the winning choices for the area until Jacques-Imo's was spotted. I had overheard people on the streetcar talking about the restaurant, so we decided to check it out. The sign out front advertises Warm Beer, Lousy Food, and Poor Service. It sounded like a gimmicky way to get people to pay for the experience of a bad restaurant. We were there and overheard people taking about the restaurant, so why not? Turned out that Jacques-Imo's was not any of those things and ended up being my favorite dining experience in New Orleans. Jacques-Imo's appeared to be a somewhat typical looking bar when entering the restaurant. That's until they take you to their table through their show kitchen to the multi-level dining room in the back. Once seated and we took a look at the menu, Jacques-Imo's was much more of a gourmet fine dining establishment than I was expecting. The meal started with garlic cornbread. I've had cornbread and I've had garlic bread, but I have never had the two combined. It was delicious. Under the appetizers, there were two items that have been on my food bucketlist for a while. I was debating which one to get, but we ended up trying them both. The first was Boudin Balls. These were stuffed with jalapenos and pepper jack cheese, served with Creole mustard sauce for dipping. I was told before going on my trip that I had to try Boudin Balls. These deep fried balls of mystery sausage meat were somewhat reminiscent of a jalapeno popper, only way better! The other appetizer which I had to try was the Fried Rabbit Tenderloin. As someone who had a pet rabbit for years, I always wondered what rabbit meat tasted like. Until Jacques-Imo's, the opportunity didn't easily present itself to find this out. The meat had somewhat of a creamy quality which was very nice. I'm not sure of this is a characteristic of rabbit meat itself, or if perhaps the creaminess was infused into the meat from being fried. Either way, I can now say I've eaten rabbit and it was very tasty. A spinach salad came next. It was topped with a fried oyster, which was unexpected. I had the Stuffed Catfish for my entree. To blackened filets of catfish were served over a mound of crabmeat stuffing. This was topped with hollandaise sauce and scallions. This dish was bursting with flavor. The seasoning on the catfish was somewhat spicy, countered with the creamy hollandaise. The crab stuffing was also very nice! The catfish was served with two sides. I chose the Red Beans & Rice and Corn Macque Chow. The red beans and rice was good, but nothing new to me. I had never heard of corn macque chow though. It's apparently a sort of stew made from corn and other vegetables. I enjoyed the dish! Jacques-Imo's Cafe wasn't on my list of restaurants to check out in New Orleans. My visit to the restaurant was completely random, but I'm glad I ended up there. Jacques-Imo's Cafe turned out to be my favorite food experience while in New Orleans! I was in New Orleans while Mardi Gras celebrations were happening. Because of this, I felt the need to eat some King Cake. For the uninformed, my basic uninformed understanding of a King Cake is that they are vaguely based on Catholic traditions and are supposed to be eaten between the Epiphany and Lent. A toy baby representing Jesus is hidden inside the cake. Whoever gets the slice of cake with the baby is then responsible for providing the King Cake at the next Mardi Gras party. I'm sure Wikipedia can do a much better job at describing the cakes than I can. My first King Cake experience happened at PJ's Coffee on Canal Street. I didn't realize it at the time, but PJ's Coffee is a big chain on the Gulf Coast. After my visit to this PJ's location, I started noticing them everywhere. They were much more prevalent than Starbucks in New Orleans, and I saw them in Mississippi on the drive home as well. I initially wasn't planning on getting King Cake when I walked into PJ's, but their signs for King Cake Lattes peaked my interest. Once I ordered the latte, I decided the next logical thing would be to have a slice of the cake to go with the beverage. The King Cake Latte was really sweet, but I'm not sure if I would have identified it as King Cake flavored if I didn't know that's what I ordered. The slice of King Cake was tasty enough, although not my favorite that I tried on my trip. I did enjoy dipping the King Cake into the King Cake Latte. There wasn't a chance of getting a baby in this cake. According to the cashier, PJ's used to put the babies in the King Cake until someone broke a tooth on one. This apparently didn't go over well with corporate, so now you just get cake. My second King Cake experience was at Mardi Gras World. This is the Kern Studios location that is open to the public for tours where you get to see all sorts of giant styrofoam and paper mache creatures being made to go on Mardi Gras floats. They begin their tour by giving everyone a slice of King Cake while they show you a video. I'm not sure who made this particular cake, but this was my favorite. It had a strong cinnamon flavor swirled into the slice of cake. 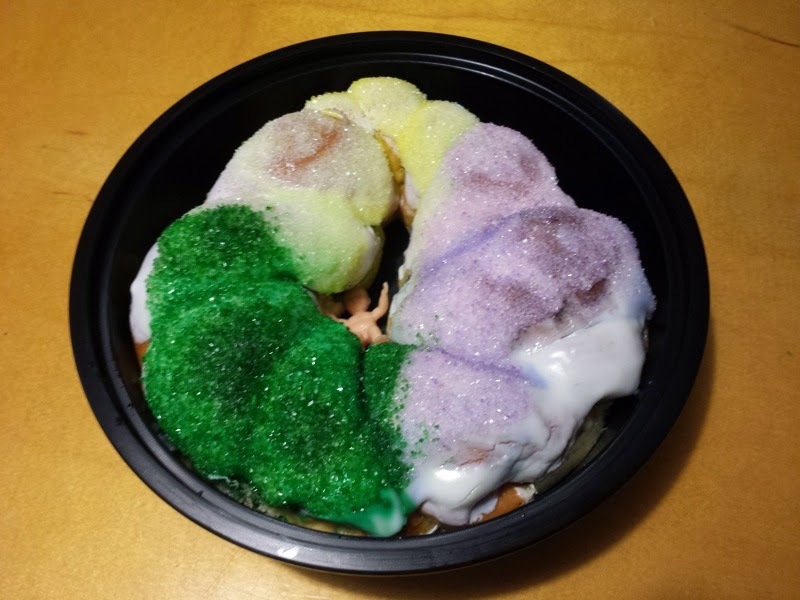 The last and final King Cake from my visit to New Orleans was made by Gerald's King Cakes. I bought this from a Praline store in the French Quarter to bring back to Florida. It came with a baby, although not in the cake itself. There may have been a slight cinnamon flavor, but nowhere as strong as the cake from Mardi Gras World. I also detected somewhat of a lemony flavor, either in the cake itself or in the icing. I started to get hungry while wandering around the French Quarter in New Orleans. This meant lunch was happening soon, and the winning restaurant turned out to be the Gumbo Shop. Gumbo Shop is located in a historic building on St. Peter Street. They had indoor seating or outdoor seating in a nice looking courtyard behind the restaurant. I had the Seafood Okra Gumbo. According to the menu, this was okra, onion, bell peppers, celery, and a tiny bit of tomato sauteed and blended with shrimp and crab into a thick brown Creole soup - served over rice. This was a very tasty okra. There were plenty of good sized shrimp floating around in there, as well as half of a crab. The gumbo had just the right amount of spice. It was very flavorful, and wasn't too spicy or bland. I liked it! Bread was served on the side. I enjoyed Gumbo Shop. The food was good and the prices were much more affordable than the surrounding restaurants that I looked at. I'd return! I decided I needed to take a trip to New Orleans. My one and only experience with the city happened several years ago and was way too short. So short that I don't count it as a visit to the city. I have heard all sorts of good things about New Orleans, including good things about the food. All of which I really didn't experience last time I was there. After I've had thoughts of the city brewing in the back of my head for a few years now, I finally took a detour during a trip to Atlanta and made New Orleans happen. I do not regret my decision at all. My very first foodie experience upon arriving in the city is perhaps one of the most famous/touristy. I had breakfast at Cafe Du Monde. Cafe Du Monde is known for the beignets and coffee. They are located in the French Quarter inside of a shopping area known as the French Market. I split an order of three beignets and tried their Cafe au Lait. The beignets were light and puffy, covered in powdered sugar. These beignets seemed to have many more air bubbles compared to some of the other beignets I've had in the past, which made them less doughnut like. I'm not a coffee connoisseur, so I find it hard to discern one type of coffee from another. This cafe au lait was made with Cafe du Monde's chicory coffee, although I had a hard time detecting flavors not present in other coffees. I did enjoy dipping the beignets into the coffee, sweetening the drink with all the powdered sugar. I did enjoy my food at Cafe du Monde. The beignets were among the best I've had and it was a good welcome to New Orleans. 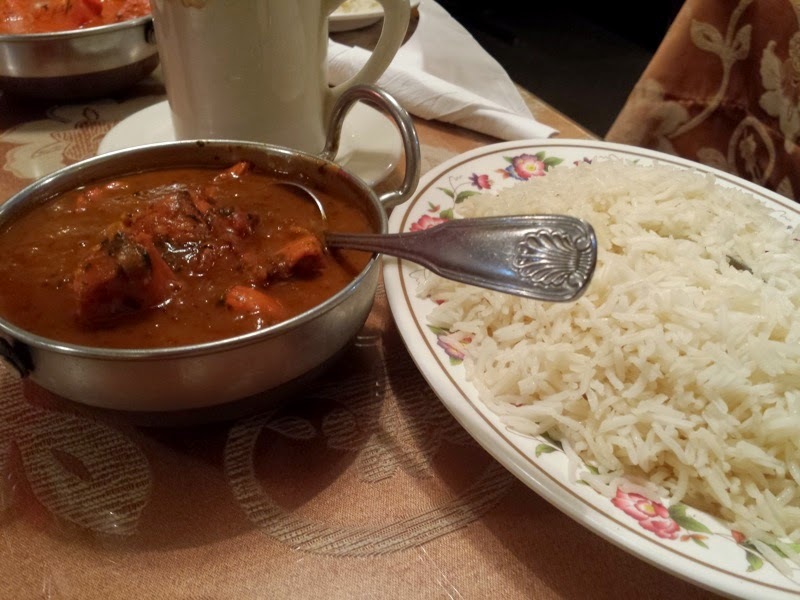 I had dinner at an Indian restaurant in a shopping center along International Drive called Taj Punjabi. I wasn't sure what to expect in an area occupied with far too many overpriced tourist restaurants, but Taj Punjabi was recommended. They had a dinner buffet available when I visited, but everyone I dined here with chose to order off the menu so I did the same. I ordered the Chicken Do-Piaj (#35 on their menu). I don't think I've ever ordered this particular dish at an Indian restaurant before. The menu described the Chicken Do-Piaj as boneless pieces of chicken cooked in a curry sauce, diced onion, bell pepper and tomatoes, garnished with fried onion and cilantro. Cucumber slices, onions, and a plate of rice were served alongside the main dish. I choose to get the food prepared with medium spice, which ended up being just the right amount of spiciness. The chicken was good, although there were two pieces in the dish which were just about all tendons/fat. Besides these, I had no major complaints. The curry sauce was delicious. Even after the chicken was all gone, I made sure not to waste any of the saucy goodness and poured the rest over my rice. I'd return to Taj Punjabi!